The number of bus journeys taken in Great Britain fell by more than 90 million in one year, official figures show. In 2017-18 there were 4.8bn bus journeys made, down 2% on 2016-17. Councils say they are “desperate” to protect services but funding cuts forced “difficult decisions”. 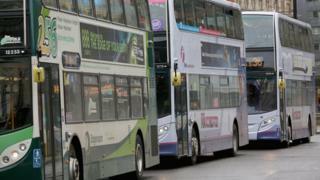 The Department for Transport (DfT) said it helped subsidise buses with £250m a year in investment. South-east and south-west England are the only regions to see the number of journeys increase in the past decade. The latest figures published by the Department for Transport (DfT) show bus fares across Great Britain have risen by 21% in real terms since 2008. Councils say they have had to reduce subsidies for bus routes due to cuts to their own budgets, which has led to services being withdrawn. Martin Tett, the Local Government Association’s transport spokesman, said: “Councils know how important buses are for their residents and local economies and are desperate to protect them. “It’s nearly impossible for councils to keep subsidising free travel while having to find billions of pounds worth of savings and protect other vital services like caring for the elderly and disabled, protecting children, filling potholes and collecting bins. In England, the number of journeys fell by almost 85m. Scotland saw a drop of 6m while Wales recorded a fall of 267,000 journeys. Figures for England were broken down by local authority and showed nine local where journeys dropped by at least 10% in the past year. In Hertfordshire, the DfT figures showed there were 28.6m journeys made in 2017-18, down from 37.8m the year before and a fall of 24%. 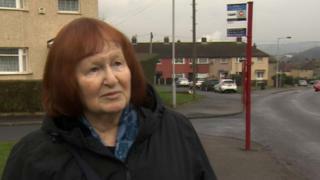 Bus user Maureen Crowther said services in and around Bradford, West Yorkshire have been “drastically” cut in recent years. “I moved here 30 years ago and back then we had a bus every 20 minutes,” she said. “People need a good bus service to get to work, school or just go to the shops. It makes me very angry because we need a bus service and the one we’ve now got is just not good enough”. Mrs Crowther, 71, gathered a petition of nearly 900 signatures opposing a decision by First Buses to reduce the 671 service in Bradford, from a half hour service to an hourly one. “Elderly people have been really badly affected by cuts to bus services,” she said. He said the company had to balance the level of service with “customer demand”. In England, more than half of all bus journeys are made within London. Bus use outside London has been falling since 2008-09, from a peak of 2.41bn journeys to 2.13bn in 2017-18. 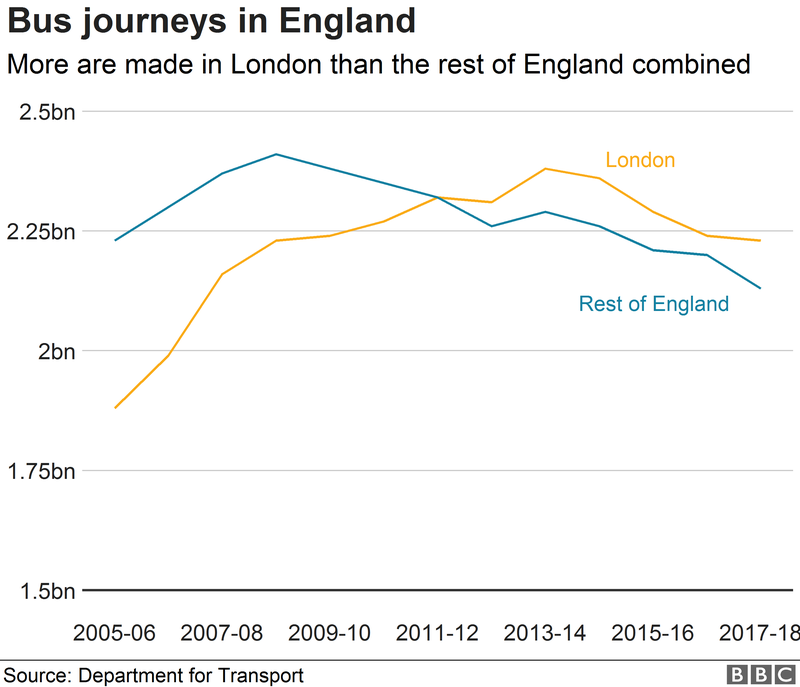 Journeys in London have also declined but are still higher than in 2005. Darren Shirley, chief executive of the Campaign for Better Transport, said bus cuts were making it harder for people to get to work or school, to visit friends and family, or to access shops and services. “We want to see a national strategy for buses, like already exists for road and rail, backed up by proper funding from central government, to start to reverse their decline,” he said. Labour’s shadow transport secretary Andy McDonald said cuts to bus services had had a “devastating impact”. “People are being denied opportunities in work and education and are cut off from friends and family, particularly those in rural areas or from low income backgrounds,” he said. A DfT spokeswoman said: “It is for councils to decide which bus operations to support in their areas, but we help to subsidise costs through around £250 million worth of investment every year. What would you like to know about this story? Use the form below to send us your questions and we could be in touch.